Scientists in the US LHC Accelerator Research Program have successfully tested superconducting magnets needed to increase LHC collisions tenfold. In the past four years, scientists at the Large Hadron Collider have accomplished unprecedented feats of physics, all with their particle accelerator working at half its design capacity. The future is looking even brighter, literally. Last week the US LHC Accelerator Research Program, or LARP, successfully tested a new type of magnet required to boost the power of the LHC—or the luminosity of its particle beams—by a factor of 10. LARP is a collaboration among the US Department of Energy’s Brookhaven, Fermi, Lawrence Berkeley and SLAC national laboratories, working in partnership with CERN. The improved magnets are one of the most critical components in a series of LHC upgrades that will be implemented over the next ten years. In the accelerator, magnets squeeze and focus beams of charged particles, directing them to a point of high-energy collision inside a detector. The new magnets, along with other upgrades, will allow the LHC to collect a larger amount of data at higher energies, making it possible to search for more massive potentially hidden particles than ever before. Lucio Rossi, leader of the high luminosity project at CERN, says the improved LHC could illuminate unexplored corners of physics. If you enter a dark room with only a candle, the room will be dim, and the candle will soon burn out, he says. But if you have a high-powered flashlight, not only can you see more of the room, but you also have enough time to get a good look around. Like the magnets that currently steer particles through the LHC, the new magnets are superconducting. A superconductor is a material that allows electric current to flow without resistance, creating a strong magnetic field. The current LHC magnets are made of a metal alloy called niobium titanium. While they have performed remarkably well, there’s a limit to the amount of magnetic field they can sustain—and they’ve gone almost as far as they can go. For the LHC to continue pushing the boundaries of high-energy physics, physicists plan to switch to magnets made out of niobium tin. Niobium tin has a greater tolerance to heat than niobium titanium, which means it has a larger window of superconductivity and can sustain a higher magnetic field longer. However, there’s a catch; although niobium tin is a better superconducting material, it’s brittle and sensitive to strain. 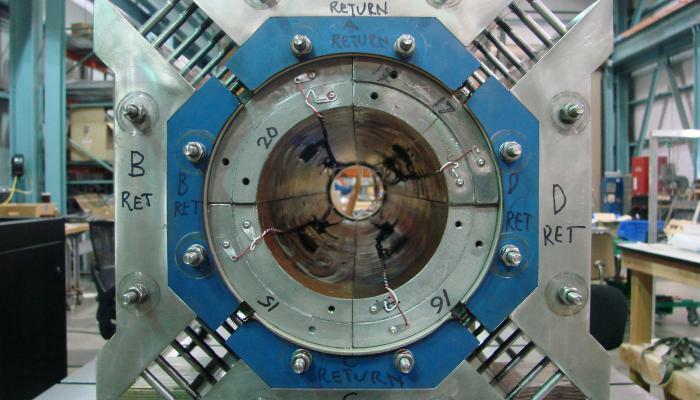 This presents some serious technical challenges because making a traditional superconducting magnet requires drawing the alloy into thin wires, gathering those wires into high current cables and then tightly winding them into an accelerator coil. If scientists took these steps, niobium tin would shatter. US LHC Accelerator Research Program scientists get around this issue by following a clever recipe. First, they coil the “raw” ingredients of niobium tin—the metals that combine to create it—and then put the whole device into a special furnace for a high temperature heat treatment, which melds the components into a superconductor with the desired shape already intact. At this point, it becomes sensitive to strain, so the scientists fill all the gaps and voids with an epoxy, which glues the brittle material together, providing the support the fragile wires need to withstand the harsh environment of the LHC. The new technology has applications beyond high-energy physics. Plans are already in motion to incorporate these magnets into medical practices such as imaging and cancer treatment. As the LHC continues to be streamlined, physicists hope to see further beyond the veil, piecing together the truth behind dark matter, dark energy, extra dimensions and other mysteries. At this scale of luminosity, previously undiscovered particles may even begin to appear. This entry was posted in High Energy Physics and tagged CERN, LHC. Bookmark the permalink.